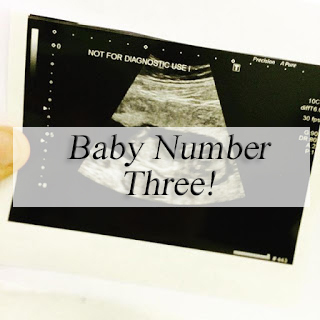 A third baby was never something I really thought about until recently, I naturally assumed after Patrick I'd find it tough for the first year and a half, before gradually I'd begin to feel broody seeing newborns, blissfully forget the sleepless nights and want another child. Though that has not been the case. You see, having three children is a different ball game in my eyes, one is a game changer also, adjusting to two isn't much harder but three, dear god how do people do it. A bigger car, a bigger house, a bigger pay packet. So many new things would be needed and I just don't feel entirely comfortable with being outnumbered with children. Currently, if both of my boys are in need, me and John can split and help them both, but with three, how does that work? Since having Patrick, I immediately said to John I'd want another child. Not now, not soon, but I don't feel 'done'. I've been told over and over that you know when you've finished having children, you just get the feeling, maybe they're wrong or maybe I I'd know if I felt it, either way - I haven't had such a feeling. In fact the opposite, when I see my boys interacting, loving each other, I can't help but want them to have more of that, I want to see more of that. The lovely Harriet from Toby & Roo posted this fantastic post, ironically the day Patrick was born, on why money shouldn't really be an issue for having more children, it made a lot of sense to me and struck home that actually, Children are only as expensive as you let them be. My boys could easily share a room to accommodate a new baby, in fact I did exactly the same with my sister when my little brother was born and also car seats are designed to sit three in the back now. I had kind of just solved a lot of my own problems by reading that post. There are however a few deeper issues that do worry me and naturally put me off wanting a third child. Noah was a straight forward pregnancy, no issues and we were all great, he was born a whopping 9lb 13 of healthiness, so you can imagine my shock when Patricks pregnancy was anything but that. Plagued from the get go with severe sickness till well into my second trimester, along with bleeds, my waters broke at 29 weeks and a premature baby followed shortly afterwards. I can't help but feel extremely let down by my body, it didn't do what it was designed to and that instantly makes it unreliable, I'm not sure it if could house another child. Nor am I sure if I want to take the risk. What Patrick went through was unbearable, and as a mother I don't know if I could be a bystander to that again. It was hard. REALLY hard. The whole situation makes me really sad, because ultimately this is the reason that having a third baby is a real kind of limbo for us. I can personally deal with the sleepless nights, the sickness and uncomfortable days in favour of giving my boys a sibling. I come from a family of four children, at Christmas there is always so many of us around, birthdays we always come together and it's just a nice atmosphere to have a bigger family. I'm sure it wasn't easy for my parents but I'm so glad for it now. So will we or wont we have a third. It's so up in the air. We're in no rush to decide, as if we do choose to have another baby, it will not be for the foreseeable future. Patrick would most definitely have to be over the age of three for it to be an option. I want time to appreciate my children as they grow as individuals, I don't want to get lost in the blur of pregnancy. Plus I think it would take some real time to get over what we all went through with Ps birth. For now, I will live vicariously through others, hoping to god that one of my siblings makes an announcement so we can finally have some cousins. I have no idea if I'd have 3. But both myself and my husband are the oldest of 3 so I think there is a good chance. Though we've both agreed we want reasonable close age gaps! What a great post. I totally agree with what Toby&Roo's blog post. I am not quite sure about having a third child. Weird but I was thinking about this exact same thing this week. I had a hard time giving birth to my son, I lost a lot of blood and was in hospital for almost a week. It must have been very traumatic having a premature birth. Hope you do what you feel is right for you both. I can relate to this post so much! I KNOW right now that I am not ready for another baby. I do suffer with the same feeling as you though, Am I Done? It's hard to figure that out. I don't see just one child on my future. I am also from a family with 4 children. My OH comes from a family with 3 children. We know we want more but finiding the 'right time' and knowing what we're up against in terms of my fertility makes it a challenge to decide if we ever will go through that again. I am also living vicariously through others at the moment lol!